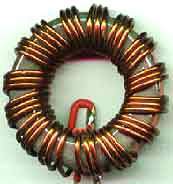 Balun for - 9 bands dipole antenna. The mast I'm using is made from a crane-arm. all on the same mast, hence I had to insert a filter for when YL wants to watch TV, while I'm 'playing'. I have to live with that the filters has a smaller range than the antenna, when the 50 ohm has to be observed. 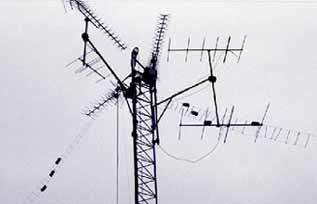 The balun is spun according to the specifications in ARRL handbook 'balanced to unbalanced 1:1, it consists of 15 winds bifillart spun, and covers the range 1.5-30 MHz. transformator, with small marks in each end of the threads, so I easily could identify which one to be connected. on a yoke, and the balun gets connected. cable are to be connected.